Overly long, but well crafted and visually stunning sci-fi film with a message that means well, but is a bit heavy-handed at times, especially at the end. The film is so technically well crafted though, and the setting so unique and meticulously captured, that you can’t help but marvel at how such a thing was made into a film at all, let alone a pretty god dang good one. Even story wise the film is pretty great; nothing groundbreaking, but it’s obvious James Cameron knows a thing or two about story. The visuals here are arguably the strongest aspects of the film. Even by today’s standards they’re pretty impressive; granted there is some CGI and green screen here and there, but all the underwater scenes, and the many structures therein, were really built and shot as you see them, at least from what I’ve read of the production. It must have been hell to shoot, but man was it worth it. And no one died or was seriously injured doing it as far as I know, so, that’s a plus. Credit once again to Cameron for pulling off the impossible and not getting anyone killed in the process, probably. The film just has a lot of cool and notable “action” moments, stuff that sticks with you long after it’s over, which is really rare, especially for an action film. 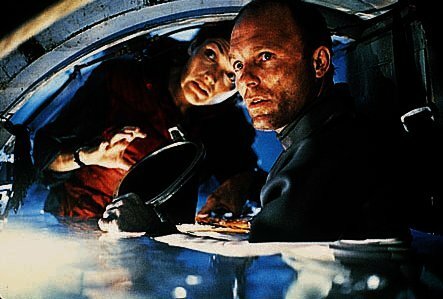 It’s almost Spielbergian at times, the sheer magnitude of the unfolding destruction, like the scene with **SPOILERS** the crane falling, then dragging the underwater facility down toward “the abyss.” **END SPOILERS** It’s just such a cool scene. And some other stuff too, like **SPOILERS** Ed Harris’ character having to drag his wife’s drowned body through miles of water to reach the station, or the alien making its first appearance in the pool, or the underwater sub battle near the end. **END SPOILERS** It’s all just so memorable and well shot, even by today’s improved technological standards. You just don’t see stuff like this in films very often. Overall, I enjoyed the film. It’s a bit slow at times, and the version I saw, the director’s cut, is about a half hour longer than the original apparently, but has a better ending, or so I hear, which, though schmaltzy and, again, heavy-handed, was pretty great visually. Those **SPOILERS** giant waves at the end looming over coastlines all over the world **END SPOILERS** are truly the stuff of nightmares. And yeah, the whole thing near the end with the **SPOILERS** atomic bomb and Harris having to go down and disarm it **END SPOILERS** didn’t make a whole lot of sense. Why not send one of the remaining Navy Seals to do it instead? Why even do it at all, for that matter? It’s not like it was in any danger of going off from what the movie told us, unless I missed something? And how did Harris and team know where it would even be? Come to think of it, how was it able to remain intact as it did under all that pressure? Anyway, I enjoyed the film. It has its flaws, but it’s a solid film when all is said and done; well acted, well shot, well-directed, well written, and visually groundbreaking. It’s also kind of a very simplistic story when you stop to think about it. Yeah, there’s aliens and military and bombs and science and stuff, but it’s ultimately about **SPOILERS** the power of love, **END SPOILERS** I think, which, again, is schmaltzy, but it works here in its own corny way. The film is also very visually similar to “Titanic” at times despite telling, naturally, a completely different story. Cameron stealing from himself, I guess. Not a bad thing. So, if you’re into slow, but somewhat intelligent and extremely well made science fiction films, I recommend it. Not Cameron’s best, but still probably like nothing you’ve ever seen before.